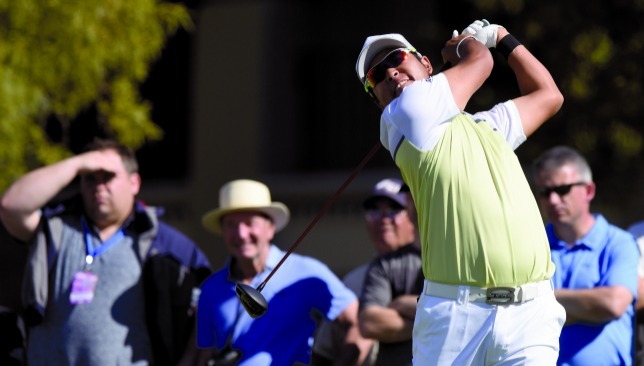 This could well be a Tiger Woods-like season for Hideki Matsuyama. With his play-off win in the Waste Management Phoenix Open on Sunday, the Japanese has won his fifth title in his last nine starts – dating back to the Japan Open in the third week of October. That includes multiple wins on the PGA Tour – apart from Phoenix, he has also won the WGC-HSBC Champions in Shanghai – and the tournament hosted by Woods, the Hero World Challenge. He also has two runners-up finishes. And while he may not have moved much in the world rankings – up one place to fifth – what he has done is close the gap against the top-four players. With 8.7964 average ranking points, he is now slightly more than 1.15 points behind No1 Jason Day (9.9346). So another victory has the possibility to take him very close to the Australian. Everyone seems to be in awe of his ball-striking these last few months, but his close friend on the PGA Tour, India’s Anirban Lahiri, has another take on the Japanese’s success. Lahiri pointed out three areas where Matsuyama has worked extremely hard over the past 18 months – his putting (and he pointed out to the long one-handed sessions he has everyday), his diet intake, and most importantly, his fitness level. In between all this, Matsuyama is also trying to learn English. Is he the greatest ever Japanese golfer? Matsuyama himself will vehemently deny that. In fact, ask any Japanese golfer, and that status belongs to Jumbo Ozaki. But Jumbo played most of his career in Japan, and won most of his 110 worldwide titles there. On the other hand, Matsuyama has proven himself all around the world. Just looking at his stats – he is one place away from matching Tommy Nakazima, who became the highest ranked Japanese player in the world at No4 and his four PGA Tour wins are the most by any Japanese (he overtook Shigeki Maruyama) – people will soon start changing their opinion. One of the things I greatly admired about Brian Lara’s batting was how nimble-footed he was. Spin, or pace, Lara seems to have an answer for anything that was thrown at him, and with plenty of time to spare. The former West Indian star, who is a die-hard golfer, has been in the UAE these last couple of weeks. He played the Abu Dhabi Invitational, and the Gary Player Invitational earlier this week. I caught up with him at Yas Links, where he revealed his massive excitement at getting to watch Tiger Woods during the Omega Dubai Desert Classic. So, that was just the cue needed to ask him an awkward question. I was betting on Sir Vivian Richards as the answer, but Lara just shuffled across and swatted it with a beauty. “Because cricket is a team sport, I will go with a team. I think my choice would be the West Indies cricket team of the 1970s,” he said as if prepared for the question. “We have had some great individual performers before that, but Clive Lloyd’s team changed the whole dynamics of the game, just like Tiger did in golf. The golf version of one of the most iconic basketball shoes – Air Jordan – have been released in the US market. Nike Golf recently unveiled the Air Jordan I Retro High golf shoe, expected to retail at $200. The first Air Jordan was released in 1984, the same year Michael Jordan started playing golf. The American is Hobe Sound, Florida. Of course, Nike had to make a few changes to ensure that the high-top of the shoe in not a hindrance while playing golf. They have put extra padding in the ankle area, while the outsole is similar to what was part of their TW ‘13 collection. A fun addition to what is the most successful charity golf event series in the world, the goal of the one-off Cart-pool Karaoke session is to help raise awareness of The Gary Player Invitational and work the event is doing in helping The Player Foundation reach its goal of raising $100 million USD for charities worldwide by 2025. The Gary Player Invitational Cart-pool Karaoke also comes as the European Tour debuted first-tee walk-on music in Abu Dhabi earlier this year. So, which pros belt out Robbie Williams’ Angel? Who is a Spice Girl Wannabe? Who has Faith and who steps into the Ring of Fire? Watch the video to find out! All for the right cause: Gary Player poses with children from the Zayed Higher Organization for Humanitarian Care & Special Needs. 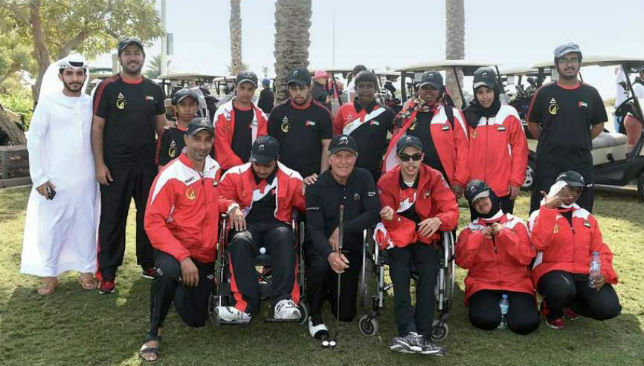 Spain’s Emma Cabrera-Bello and her team won the Gary Player Invitational, but ‘Golf and Giving’ was the biggest winner as nearly 100 professional golfers, celebrities, sporting greats and business leaders joined host and course designer, Gary Player, at Saadiyat Beach Golf Club. Cabrera-Bello’s team tallied 12-under par for the round, which was one better than the team led by Chris Wood. Three teams – led by Georgia Hall, David Howell and the UAE’s only professional golfer Ahmed Al Musharrekh – tied for the third place at 10-under par. The tournament raised more than Dh183,000 for children from Zayed Higher Organization for Humanitarian Care & Special Needs. Held in conjunction with the Abu Dhabi Sports Council, under the patronage of HH Sheikh Nahyan Bin Mubarak Al Nahyan, the Abu Dhabi event was the first of six 2017 global series events, which together have helped The Player Foundation raise more than Dh227 million for charities worldwide. Among the special guests for the second edition of the tournament in the UAE capital included golf pros Darren Clarke and Trevor Immelmann; cricket greats, Ricky Ponting and Brian Lara, as well as Boyzlife singers, Brian McFadden and Keith Duffy. Joining Clarke, Immelman, Wood, Howell and Cabrera-Bello in representing professional golfers at the event were Beth Allen, winner of the inaugural Fatima Bint Mubarak Open at the same course last year, Joost Luiten, Caroline Martens, Jason Scrivener, Victoria Lovelady, Victor Dubuisson and Thomas Aiken. Springbok great Victor Matfield, model, racing car driver and television personality, Jodie Kidd, and the UAE’s own, Emirati comedian, Ali Al Sayed also added some serious star-power to the event. Host Gary Player said: “I simply love visiting Abu Dhabi and of course, Saadiyat Beach Golf Club is special. Aref Al Awani, General Secretary of the Abu Dhabi Sports Council, said: “The Gary Player Invitational represents both the best of sport, as well as the best of Abu Dhabi. “Bringing some of the world’s most iconic athletes together here in Abu Dhabi to raise funds for such a worthy cause highlights the emirate’s strong sporting credentials as it also remains true to the spirit of generosity that Abu Dhabi is known for. Key supporters of the events include the Abu Dhabi Sports Council, Etihad Airways, TDIC, the Park Hyatt Abu Dhabi, SAP and Rolex. The 2017 event is the second event in what is a five-year agreement to host the event in Abu Dhabi.